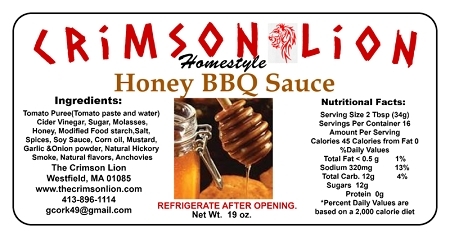 This Honey bbq is popular and similar to the Hot& Spicy but it provides a terrific honey glaze on chicken, ribs, steak. Contains tomato puree, sugar, molasses, honey, cider vinegar, modified food starch, salt, spices, soy sauce, corn oil, mustard, garlic & onion powder, natural hickory smoke, natural flavors, anchovies. We released this barbecue in mid-2010 and the customers loved it for their cookouts. Hot Raspberry Barbecue Sauce: 19 OZ.